“At last! Beyond The Movie! 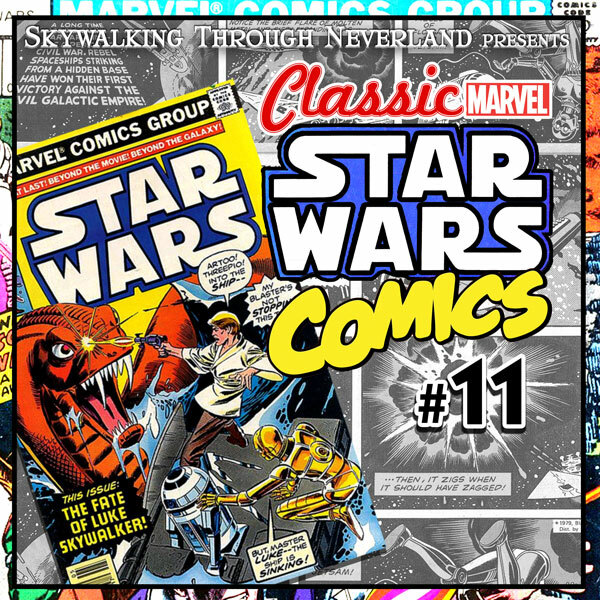 Beyond the Galaxy!” reads the cover of each issue of the Marvel Star Wars comics from 1977 and beyond. Richard, Sarah and Star Wars artist Randy Martinez dive into these classic Marvel Star Wars comics from the 1970’s and 1980’s. In this episode we look at Star Wars #11: ’Star Search’ or, “the search for Luke Skywalker.” Sound familiar? The Force Awakens already happened in 1978!! Listen as we check out the similarities. This issue also features our favorite things: Crimson Jack, Han and Leia getting it on, a Star Wars Holiday Special crossover and…Peter Pan? Wow. Let’s take a listen. Synopsis: This issue picks up as Han and Chewie blast away from Aduba-3. Everything is smooth sailing until they run into an old friend, the man that rocks a unitard like no other – Crimson Jack. Jack and his band of space pirates apprehend Han and Chewie, however they aren’t the only ones Jack has captured. He has managed to also kidnap Princess Leia as she was out looking for Luke Skywalker and holds her for ransom. How will our heroes get out of this one? Meanwhile Luke and the droids have crashed in an ocean on a planet in the Drexel system. And if that wasn’t bad enough, now he has to battle a sea beast if he wants to make it to the next issue. Send emails to share@skywalkingthroughneverland.com and follow us on Facebook.